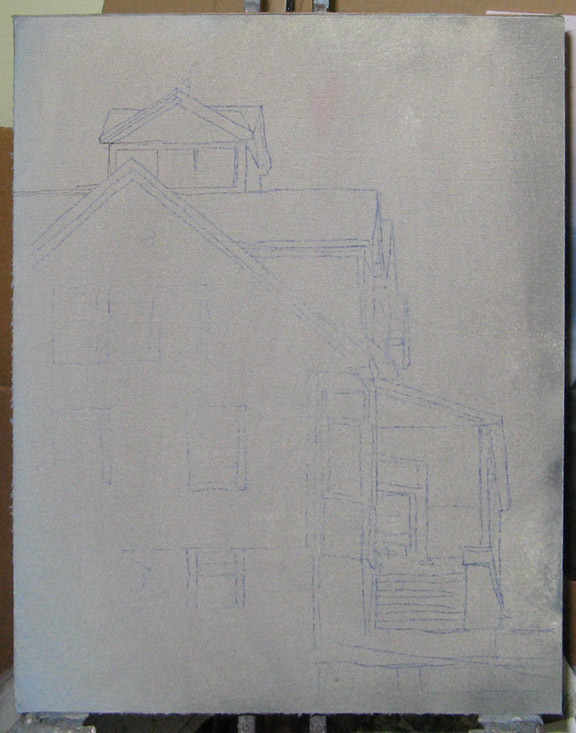 This is a fairly straight forward painting of Maine building forms. Attention was on technique and palette. 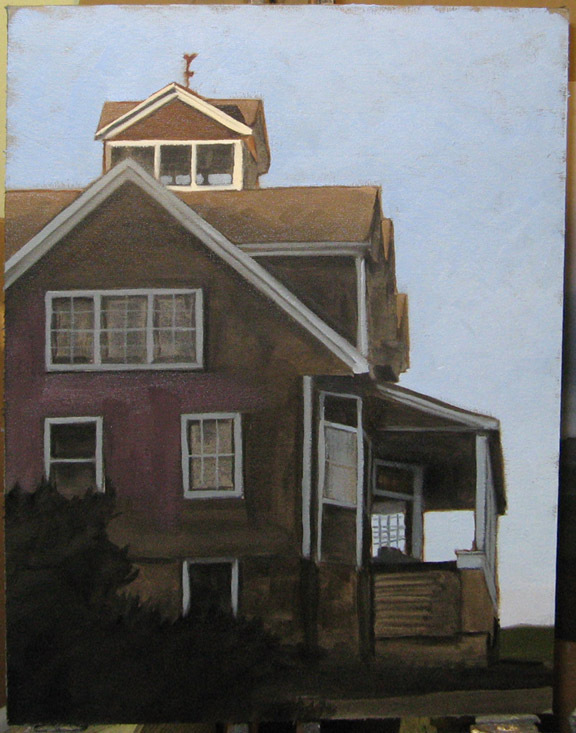 This is painted from a digital photo and heavy alterations were done to the composition during the sketching phase; I moved the roof lines a bit and straightened up the perspective. If you want to see the original digital please ask. For this composition I started with a 14x11 canvas and washed it with the crud at the bottom of my thinner jar and allowed to dry for a day. I then layed my drawing over the canvas and transferred on the drawing with carbon. 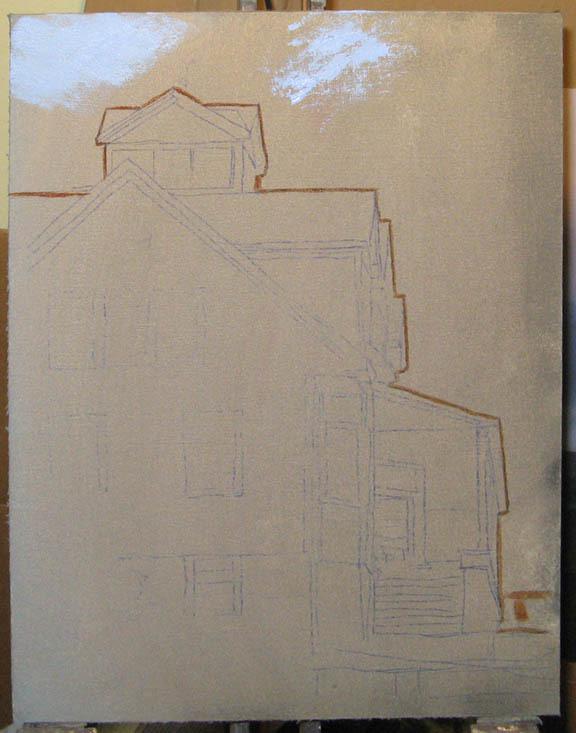 Its very important to work through compositional problems during the drawing phase as there is nothing worse than trying to fix the location of a building once you have paint transitions done. 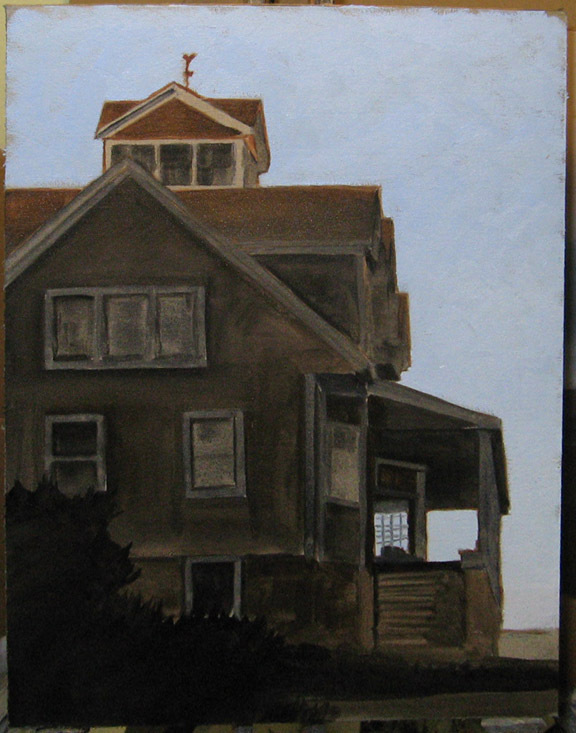 Using a thinned down Burnt Sienna I painted the transition between sky and building forms. 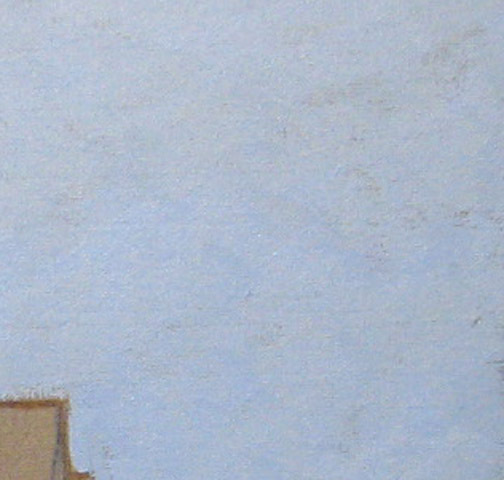 I use Winton brand paint for this specific task as its pigment content is low. The low pigment allows for other colors to go over it with mudding and it'll dry super quick if thinned down. Next I mixed my sky color in three parts. A medium light blue/white, lighter version, and lighter version with a touch of red. Attractive stroke work can be rough and undirectional. Notice that paint coverage is not complete. 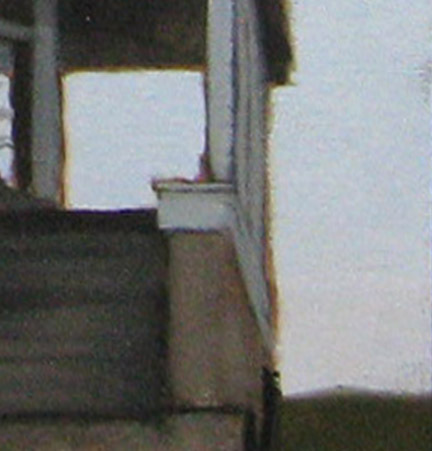 For this painting I want some of the underpainting to breath through and add those extra forms. I mixed up basically two dark tones (brown version and blue version). Both were painted on very thinly and no concern was made for actual value other than it being darker than reality. I used the brown darks for building forms that were not white and the blue version for white parts (window molding, roof lines, etc). 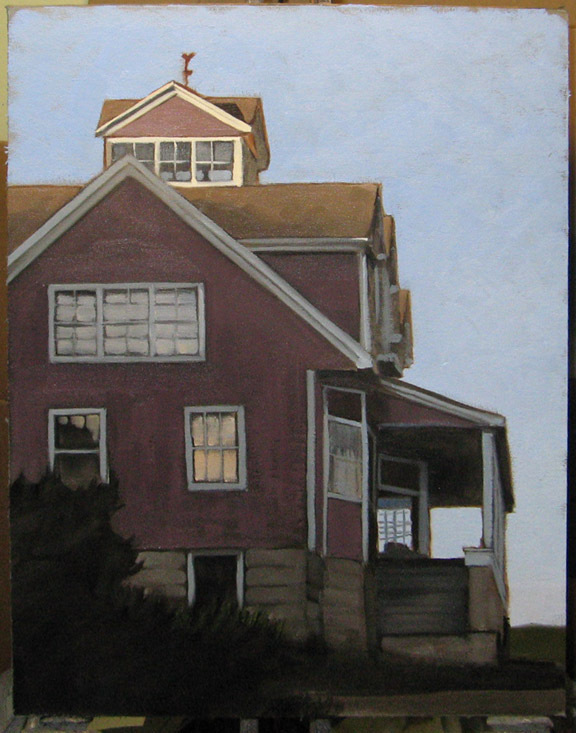 The part of the building that is in the sun got a second layer of burnt sienna to lighten and warm it up a bit. The darkest areas got black - either tube or mixed. After the underpainting was done I let it dry for a couple hours. Then I ran a dry paper towel over the painting to mop up any remaining paint that wasn't dry. The goal here is to be able to apply paint over the underpainting without worry about it mudding while having some ability to get it to blend. I mixed up the colors that will be my roof in and out of the sun. I then decided on the palette for the building and mixed up the in and out of sun colors for it. The "in sun" versions being lighter and slightly warmer. Working from the top I kept the brush dry and layered on the new paint over the underpainting without completely covering it. The white for the window and roof trim is basically tube white and a touch of orange and a little brush dirt. Note I made a mistake and thought it was wise to paint the foreground roof apex as being in the sun. It looks better in the shade. Corrected the roof apex and its in shadow now. For the windows I mixed a gray that is nearly neutral. Often times its best to use a cool blue for whites in shadow, but since the house is facing the sun and the light coming from that direction is warm it made sense to keep those areas neutral and not conflict with blackground blues. Carefully looking at my stock picture I used different shades of the window trim color for the different parts of the house. Under the roof its nearly black, but in the front its more white. I picked out my shadow building color to be a warm earthy violet. I Allowed some of that underpainting to show and was not overly concerned with the precision of line, but idea of the stroke is understandable. Lower cement forms done with a brown/grey and steps and other lower areas done. Details aren't so important here so lets keep it simple. Note I made a mistake on the inner window areas and used a brush that was too big. I wiped and repainted the entire window so I could redo the underpainting. 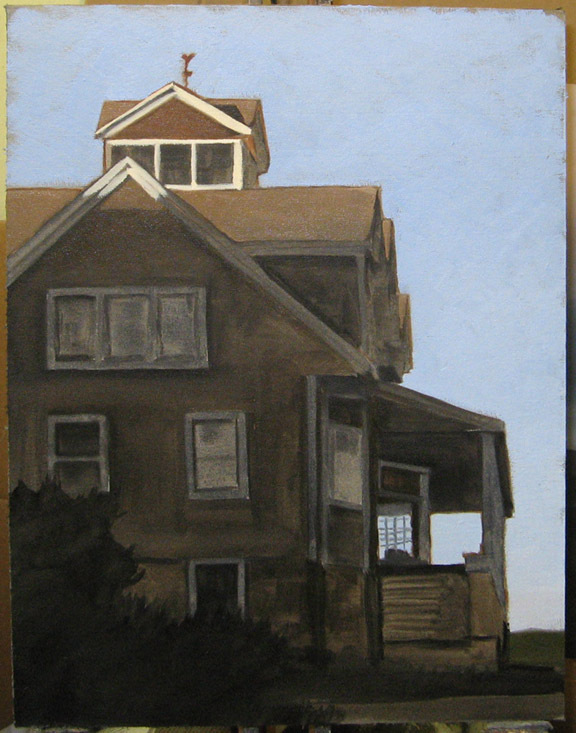 Finished the windows with a light warm gray (reflected sky). I added some greens to the bush and grass areas and some bright greens to the little background area on the right. Remember you can tell a lot of story from a reflection in the window. If you have any questions please ask via email or you can call me on skype. I hope that some of this info is useful and I'll add more demos in the future.